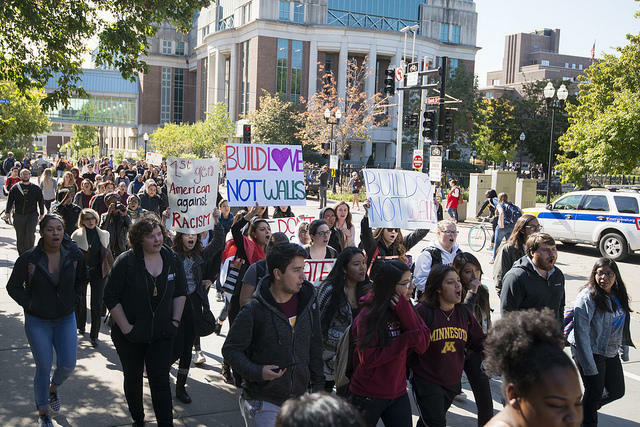 Campus protest at the University of Minnesota in Minneapolis in 2016. Are college campuses becoming battlegrounds testing freedom of speech? Do students and faculty feel free to discuss controversial ideas? Are college campuses battlegrounds for the freedom of speech? It depends who you ask. A number of high profile incidents on college campuses have fueled a debate over whether First Amendment rights are being protected when, for example, speakers are shouted down by protestors or outright canceled by campus administrators. Last year, North Carolina legislators passed a law that required the UNC Board of Governors to develop and adopt a policy to "restore and preserve campus free speech" on UNC campuses. The policy punishes students for disrupting others at the state's public universities. But critics have said this policy can have the opposite intended effect of "chilling" protected speech on campus. Has that been the case? Do students and faculty feel free to discuss and protest controversial ideas without fear of repercussion? Some allege this battle over free speech on campus is politically motivated. As students head back to campus, are they entering a culture war? Mike Collins talks with people on different sides of this issue and we learn what's happening locally. Robert Shibley, Executive Director, Foundation for Individual Rights in Education (FIRE), a Philadelphia-based nonprofit that advocates for free speech on campus. Michael Behrent, Vice-President, North Carolina State Conference of the American Association of University Professors (AAUP) and Associate Professor of History at Appalachian State University. Jesh Humphrey, Vice Chancellor and General Counsel, UNC Charlotte. He is also UNC Charlotte's Responsible Free Speech Officer.